I’m sure every quilter has the same kindling and thrill I do - you see a square of fabric and it begs you to transform it into something new. So I turned 2 squares into 1 hourglass. A magic hourglass. One square of a print, one square of background fabric. 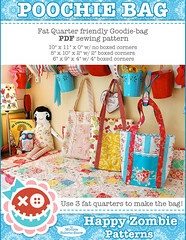 Any size square will work as long as two rules of thumb are followed (more on that ahead). 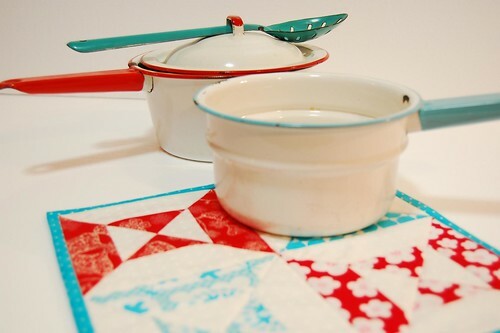 For my potholder (which is headed to Heather’s new red & aqua rockin’ kitchen), I made four magic hourglasses starting with 5″ squares - and each one finishes at almost it’s original size no matter what the size of square you start with. All seams are ¼”. 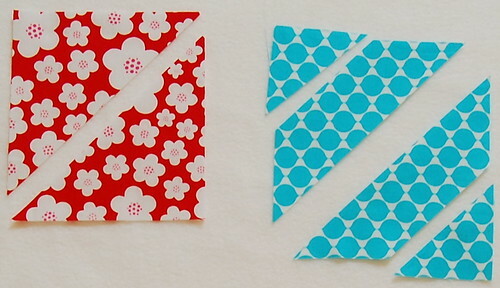 1) For each print square and background square - cut in half diagonally. Red fabric by Patty. 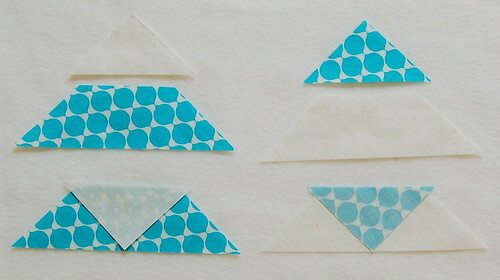 2) Cut each triangle in half long-wise. Rule of thumb #1: Find your half measurement. It does not have to be an exact half, but do use the measurement you’ve chosen consistently on all your blocks of that size. Aqua fabric by Mo. 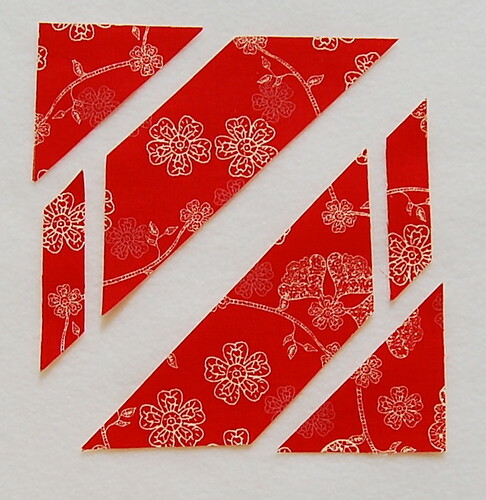 3) Trim ⅝” off (and toss) one end of the trapezoid. Rule of thumb #2 - this measurement is etched in stone and is used for every size block. Charm, Layer Cake… whatever size. 4) Join a background triangle to print trapezoid/print triangle to background trapezoid to make a triangle unit. Press to the print. Because you’re working with the motherload of bias edges, press gently with steam. 5) Audition triangle units - another option beside a double hourglass is to make a square-in-a-square-ish block (how cool is that!). Red fabric by Bari, aqua fabric by me. 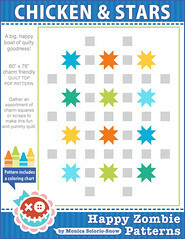 6) Join triangle units to make magic hourglass block. 7) Trim of dog-ears, join blocks and make something. And now I will cook something. Hahahahaha - I kill me. So fun! I can’t believe I haven’t tried these before. They are for sure on the [enormous] to-do list now! Wow, I love it, I will have to give this a go. You make it look so easy. I will email pic when I get it done : ) Thanks for sharing. I absolutely LOVE this! Thanks for sharing!! You finished it! Despite SHY distractions! Hmmmm…do I see a ten-minute tute in your future????? Love it! And once again you make it look easy, so why not have a go! 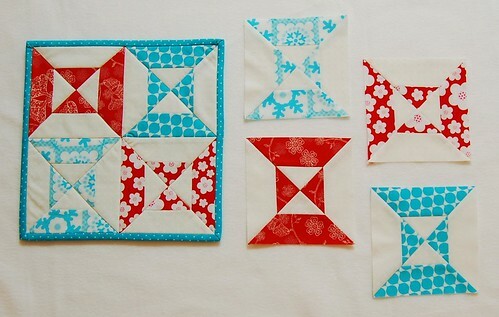 what a fun, easy way to make dhg blocks. the last time i made this pattern i almost cried because of all the trimming, folding etc. (they were made of rectangles…ugh!). Great pot holder!! She will love it!! Hmmm… were you cooking Chinese Take out?? Just curious. Those colors are wonderful together! Thank you Monica! You have the best eye for color and come up with the cutest things to make! 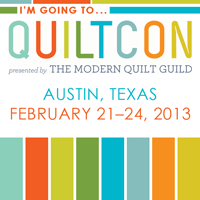 Definitely will have to try this at the quilting retreat next weekend. Since I won’t risk getting it dirty (they do feed us), it’ll be the perfect time to try it. 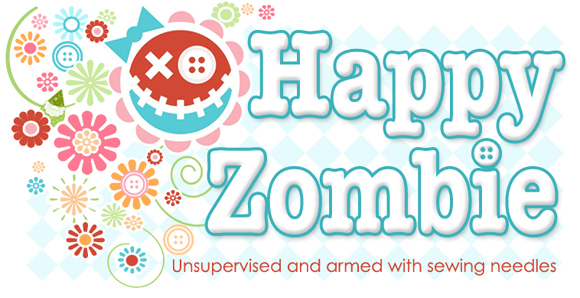 Cute and a very nice tutorial as well. Now as well as the Go baby pam is making me get I’ll have to get a new laptop so i can consult this as I cut! Hmm…do they have a die for this, think I’ll go look! Very, very cute! 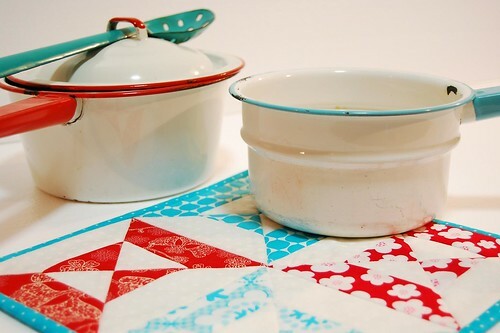 Will we ever tire of red and aqua??? I think not. don’t you just love it when creativity strikes and it works perfectly? Kudos!! I would caution against cooking–something might get food on it and that leads to laundry. See? Double no-no. This IS awesome - fun - smart - and you’ll find me making one SOON !!! Very, very cool. And of course, the colors and pictures are just lovely. This is beautiful, I just love these colors together! Thanks for the tutorial! I love the happy vintage colors you used! They look perfect together! These are so cute! 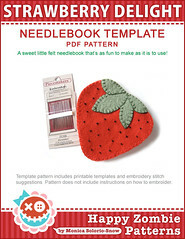 I am thinking a couple of these would make a cute mug rug! This looks so easy and fun! Thanks so much! 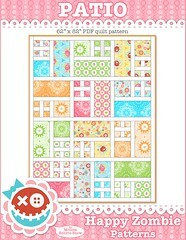 I can’t wait to try it out - wouldn’t a whole quilt of those be awesome! Those are adorable! I love the fabric, too. 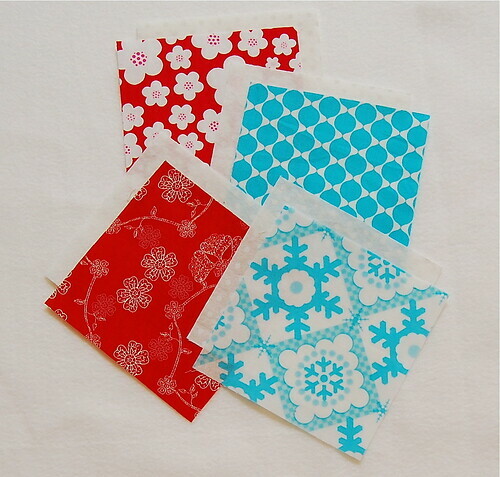 Did you know that Karen is planning an aqua-and-red theme for her Christmas tree and packages in 2011? I’m thinking she should use this fabric for gift wrap! Oh that’s pretty. Should I try it?? What am I saying, of course I should try it! You do make it look easy, but I’m sure I can goof it up somehow! Cooking…oh Monica, you are funny! 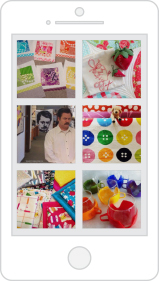 Great pictures and great pattern Monica. Thanks for the bright spot in my evening! I now know exactly what I’m going to do with some of the charm squares I won from you (which I have been hoarding)! Great tutorial, love the magic! Besides this being a fabulous idea, you make me snort out loud with your comments. You kill me, too! 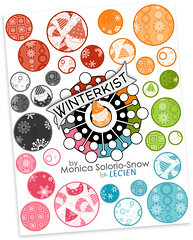 This is awesome Monica! I’m definitely going to be testing this block out! What cute little blocks. Thanks for sharing the how to. What a cool technique!! Thanks for the tutorial! ooooooooo, ahhhhhhhh!! 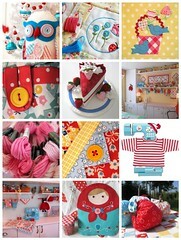 Love everything about this project…yummy colors!! Oh Monica, how amazing is that???? It looks great and you´ve done a fantastic job. And as always the colors…..love the combination!!!! You know, if you ever get tired of those blocks, or the dishes for that matter, feel free to send them my way. Oh yes, a little transformation just brings a new look to your work! Love all the colors going on! I LOVE IT!!! Thank you so much, Monica. It’s just too awesome to use as a pot holder, so I’m going to find the perfect spot to hang it. You’re the best! Clever Girl!! I love it! They look sort of like thread spools to me. You’re so funny. This is a darling project. I love little projects that I can make in an afternoon and feel so good about afterwards. Your little pans are so colorful. I love them. Thanks so much for this awesome tutorial! I had some leftover charm squares and made a potholder. So easy! I’m thinking a layer cake would make a neat throw using this technique. Okay, I may be missing something here since everyone else seems to have had no problem with this, but where is step 3? How do I know how big to cut that corner triangle? Is that an adjustable measurement or a fixed one? HELP!!! Thank you for the tutorial, I can’t wait to give this a shot! I really love red and aqua together,too! The colors are sooo cute! Thank you! 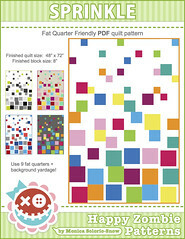 Finally got around to making some of these (using Moda’s Hoopla charm packs and a WOW fabric cut into 5″ squares for a baby quilt) and they are adorable and SO easy. Good thing, since I found out since starting that it’s going to be twins, so I’m going to make twice as many for two! 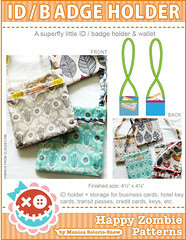 Thanks so much for providing such a great idea for free … this was better than many of the store-bought patterns that still look like charms just sewn together!